(Newser) – One hundred million years ago, a sauropod that stretched more than 120 feet and weighed some 70 tons existed—perhaps the largest creature to ever roam the Earth. 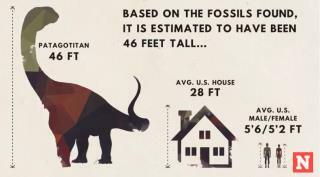 Over the past few years, researchers have excavated fossils from six young-adult dinosaurs from a Patagonian quarry, and New Scientist puts stats for Patagotitan mayorum in perspective: The creature would have been the length of about seven elephants. The AP estimates it would have been as heavy as a space shuttle, with team member Diego Pol noting that placing Patagotitan next to a T. rex would be like putting "an elephant by a lion." Per the Atlantic, that means the plant-eating Patagotitan was double the size of the already-huge brachiosaurus and apatosaurus, and about 10% larger than the reigning dinosaur giant, a titanosaur known as Argentinosaurus. I wonder if a .50BMG would drop one. I would love to see one of these in person. It will never happen to me but I hope they clone them someday. Whoever put that graphic together needs to go back and do a bit more research about how tall the average American is.